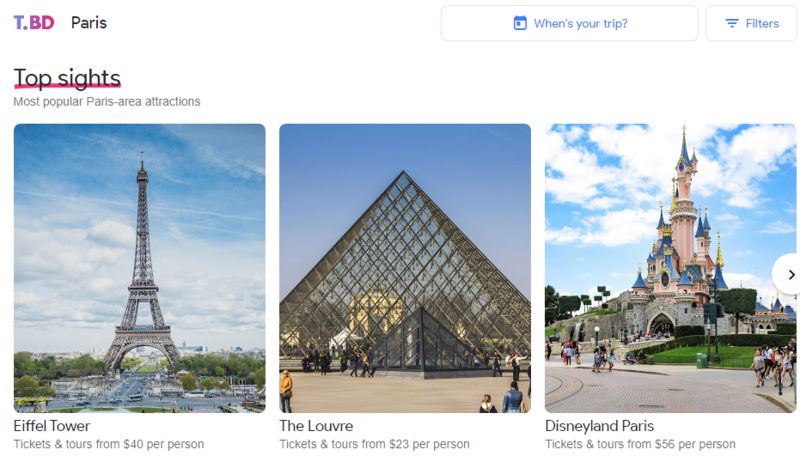 Tech giant Google is expanding further into the travel space with a new planning website called Touring Bird. It’s no secret that Google has been sneaking further and further into the travel domain over the past few years, with the Google Flights, Google Maps and even Google Destinations and Google Trips. Now, they’ve released a tool designed to streamline travellers experiences even more. The new app helps travellers “explore, compare and book tours, tickets and activities from multiple destinations around the world” according to its webpage. Starting with just 20 cities, including top destinations like Rome, London, Paris, New York, New Delhi, Berlin and Barcelona, the app connects travellers with popular attractions, suggested tours and activities along with prices, options for free guided tours and recommendations from locals and travel bloggers. As Conde Nast Traveller (CNT) points out, a quick browse of the featured cities shows mainly first-timer experiences, like the Louvre, the Empire State building or the Hollywood sign. Foodies may also despair at the app’s offerings, with major chains like the Hard Rock Cafe appearing as food options for multiple cities. Though it may seem like a one-stop-shop for tour and activity planning, CNT also rightly points out that the app may have trouble appealing to millennial markets who are looking for “one-of-a-kind immersive activities”, with a focus on local cultures and experiences. Have you been fearing the rise of Google in the travel industry for some time? Well, prepare to be a trembling mess after reading this.